Unlike the wild Nineties, Russia today has enough local capital to support stable economic growth. But the rewards for foreign investors remain substantial. Alexei Ulyukayev, first deputy chairman of Russia's Central Bank, mentioned two attributes of the Russian market that appeal to Western investors. First, medium-term forecast projects sustained economic growth, which leads to high demand for monetary and financial investments. In an economy growing by 1-2 percent annually, investors can earn upwards of 10-12 percent only on moderately risky projects, and in case of high economic growth, 15 percent is realistic for reliable projects. This is the main factor explaining the inflow of investment into Russia, the banker said. Second, Russia has very good fundamental indices, including huge foreign reserves and low state debt, which minimises investment risks. For this reason international rating agencies regularly upgrade the Russia's rating. While corruption is a barrier to investment, Ulyukayev said investors primarily focus a high economic growth rate and the resultant guaranteed profits and low country risks. These represent the foundation for foreign investment in Russia. But this past August as a result of the worldwide credit crisis, there was a net outflow of $5.5 billion from Russia, according to the Central Bank. Ulyukayev said this net outflow was the first in many months and was minimal. Russia's Ministries of Finance and Economic Development had forecast an outflow of $10.9 billion in August. According to the Bank of Russia, total foreign investment for the period from January to August (taking into account capital outflow in August) was $59 billion. However, Ulyukayev predicts that net forein investment will decline to somewhere in the range of $50 to $55 billion by the end of the year, although the structure of investment in Russia will improve, because the reduction will impact almost exclusively credits and international loans. The banker said that although portfolio investors, who put their money into securities, reduced their investments in August, some of them have reinvested money in Russian securities, as evidenced by stock indexes, which have soared to 2000 points and higher. In fact, there is no reason for the flight of foreign investors, Ulyukayev said, adding that the fundamental data concerning the Russian market should attract them to the country. He believes that direct foreign investment will continue to come to Russia because money is mainly invested in modernization. By the end of the year, seven generating companies plan to float their shares as part of Russian's reform of its electricity monopoly RAO UES. Since the energy sector is highly attractive to investors, we can predict the approximate amount of investments in it. How can Russia protect itself from the global financial crisis? Ulyukayev said it is using its gold and foreign currency reserves to maintain the stability of the financial system. The Central Bank has sufficient funds to lend to commercial banks, though such loans are in the form in overnight refinancing loans. However, Russia has a policy of renewing its loans, and the Central Bank may make loans for terms up to 12 months. Ulyukayev said that few banks used this mechanism in the past, but the number of such clients increased dramatically in September. Now many banks are approaching the Central Bank seeking refinancing and, in the case of reliable borrowers, obtaining money to refinance loans. In other words, the Russian economy will have enough money to fund development even if banks are unable to obtain credit in the international market, the banker said. According to Ulyukayev there are two ways of making the ruble a freely convertible currency: it could either gradually become a reserve currency for a number of Russia's trading partners, or the International Monetary Fund (IMF) will officially grant it freely convertible status. The bank official said the ruble is gradually becoming a reserve currency in the CIS, where an increasing number of settlements are made in rubles. Many of these countries are accumulating rubles, and the volume of ruble transactions in the former Soviet republics now exceeds Russia's trade with them. Moreover, since 2006 large international financial institutions, such as global payment systems, have started making settlements in rubles, using the ruble as an official accounting currency. Issuers from different countries can now freely issue ruble-denominated British, American or other securities, and make settlements in ruble equivalents. In other words, the ruble has become an increasingly widely used instrument in international financial markets. Respected investment banks say they would like to have ruble-denominated assets, and central banks are not against having ruble-denominated assets, as well. In fact, Ulyukayev said some central banks already have such assets. Does Russia really need the IMF to officially recognize the ruble as a freely convertible currency? This would no doubt be useful, but it is not crucial for Russia at the moment, Ulyukayev said. What Russia needs now is to gradually expand the zone of ruble circulation. To attain this goal, it should encourage the leading Russian exporters who deal with Western Europe, China, Japan and the United States to start making settlements in rubles. 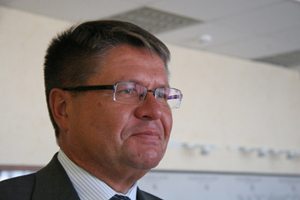 Dr. Alexei Ulyukayev (Economics) was born in Moscow on March 23, 1956. He graduated from the economics department of Moscow State University in 1979 and from its post-graduate course in 1982. He also holds the title of doctor of economics from Univesite Pierre-Mendes France - Grenoble 2. He is fluent in English and French. He is married, with a son. 1982-1988, assistant professor at the Moscow Institute of Construction Engineering. 1988-1991, consultant, section head in the magazine Kommunist. 1991, political analyst at the newspaper Moskovskiye Novosti. 1991-1992, economic adviser to the Russian government. 1992-1993, head of the group of advisers to the prime minister. 1993-1994, aide to the first deputy prime minister. 1994-1996, deputy director of the Institute for the Economy in Transition. 1996-1998, a deputy of the Moscow City Duma (municipal council). 1998-2000, deputy director of the Institute for the Economy in Transition. 2000-2004, first deputy finance minister of Russia. Since 2004, first deputy chairman of the Central Bank of Russia.